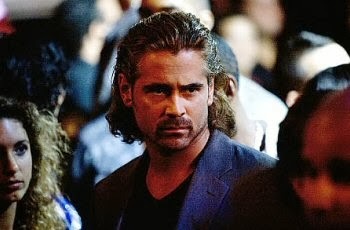 Colin Farrell in "Miami Vice"
The 37-year-old actor had battled his problems for a decade until he appeared in 'Miami Vice' seven years ago and went straight into rehab to get help. He told 'The Late Late Show': "'Miami Vice' wrapped ... and I was put on a plane and sent to rehab." The 'Seven Psychopaths' star admitted he was "out of control" because of his "high tolerance", and he struggled to learn when to stop because he didn't know his limits. He added: "I'd gotten out of control - for years I could indulge in certain things ... I had quite a high tolerance for various drugs for years, I thought. "It accumulated to the point where I couldn't put my foot on the brake anymore." Colin has discussed his addictions in the past, admitting it was extremely difficult when he went sober and tried to adjust to life without being "drunk and high". He previously said: "I began to come out of the haze that I was in and had burrowed myself into so deeply. "Basically, I'd been fairly drunk or high since I was 14. I was very drunk and high for 16 years, so it was a tough life change, and I was dying. I'm one of the lucky ones."